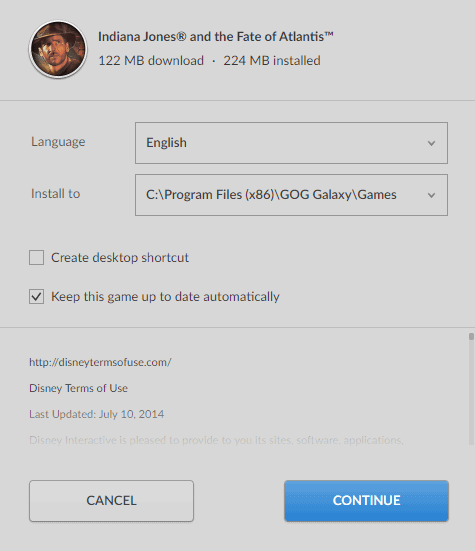 GOG Galaxy is a gaming client for PC and MAC OS X by GOG. Unlike Steam, it is completely optional for GOG customers who can download and play purchased games without the program as well. If I had to pick a games store on the Internet, I'd select GOG over any other store out there because of its stance on DRM, and Dollar to Euro handling of game prices. While I love GOG, it is not the Store that I use the most. The main reason for that is that its catalog is tiny in comparison to that of Steam. GOG offers mostly classic computer games and independent games on its store. I downloaded GOG games manually to my systems and played them as if they were independent games before the initial release of GOG Galaxy. 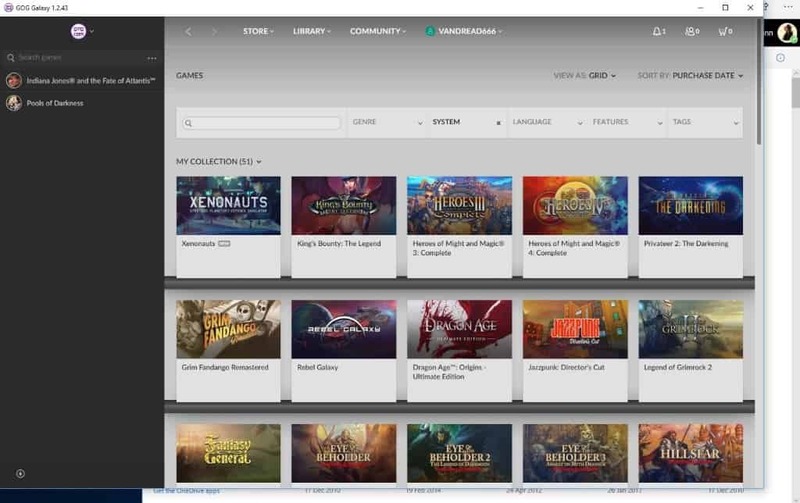 The process changed with the release of the gaming client as it centralized management of all GOG games and features nice-to-have features such as storing savegames in the cloud, bandwidth limits, auto-update options, rollback support, and community and friends features. Customers can ignore the client and run games individually instead if they prefer that. GOG Galaxy is available for Windows and Mac OS X currently. Windows users can install the client and sign in to the GOG account to start using it. If you have GOG games on the computer already, you may want to use the "scan and import folders" feature to add games to the Galaxy client so that they don't need to be downloaded and installed again. You may want to check the settings on first start to make sure all are set to your liking. You get to control global features such as the default installation language and folders, the game overlay, bandwidth restrictions, cloud saves, achievements, or auto updates there. Some of the features can be turned off for individual games as well. If you don't want a particular game to update automatically or push saves to the cloud, you can disable those options in the game configuration menu. The Galaxy client comes with a built-in store and library management among other features. You can browse your existing library with a click on the library menu item in the interface, and filter games by platform as well if you want to. Search and other filters are provided to find games quickly. A click on any game opens the details view in the client. It includes a description and activity information, and options to install the game if it is not installed already. Select a location on the local computer system to install the game to. Default is GOG Galaxy\Games on the installation drive. Select the desired game language if multiple languages are supported. Create a desktop shortcut for quick access. Any game that you install is listed in the sidebar for quick access. Just select it and hit the play button to start playing right away. Access to additional content, game manuals, soundtracks, wallpapers, and other items is provided in the client directly. One useful feature of GOG Galaxy is the client's rollback feature. On Steam, if a game update breaks things you cannot really do anything about that. On Galaxy, you simply pick an earlier version of the game and roll back to it. The rollback feature makes game updates less of a problem as you can always go back to a previous version if they break something. Most GOG games are not updated often which in turn means that you won't experience as much breakage as on other platforms. The main reason for that is that you won't find most mainstream full price games on GOG but mostly independent games (which may update frequently) and classic games (which usually don't). Galaxy comes with community features such as friends lists and other social features such as achievements and multiplayer integration for games that support GOG's implementation. I have not used these features up until now due to a lack of friends using the client and lack of games support. When it comes to multiplayer, Steam, Battle.net, uPlay or Origin are the platforms that are used for that. Still, the integration of multiplayer and friends functionality opens up the possibility that GOG will one day become a contender. All it probably takes is one exclusive popular game to push multiplayer functionality. GOG Galaxy is a convenient optional client for the GOG platform that centralizes game management first and foremost. It gives users more control over games and includes several nice to have features such as rollback options or auto-updating of games. The one thing that is holding GOG back is games support. While it is heaven for classic games and many independent games, it is not the place to go if you are looking for new Triple A games that are not produced by CD Project (which owns GOG). Now You: What's your take on GOG and GOG Galaxy? You nailed it right there. If you want to play an old title that’s “not compatible with your version of windows” go and see if you can find it on GOG. Gog Galaxy works on Linux with WineHQ. Thanks for confirming this. A dedicated client would be great though. Wonder how many Linux users GOG has anyway. I’m a pure Linux user, and I also use GOG quite a lot. So there’s at least one! I’ve switched to only buying games from GoG. If those of us who are aware of DRM and dangers it brings to PC world don’t act then who will? GOG is the best — it’s the only place I get games anymore (I stopped being a fan of Steam years ago). I haven’t tried Galaxy. based on this review, it doesn’t seem to offer anything that I would find useful, but I’ll take a look out of curiosity.